The prevailing story of Machu Picchu is that it was built by the Inca as a royal estate and religious retreat in 1460-70. It would have been practically impenetrable, since reaching them would have meant ascending a steep slope covered with dense vegetation. The whys and wherefores are still open to speculation. One is the Incas wanted to protect themselves from the Spanish. Whatever the reason, after a hundred years the site was abandoned and forgotten for 500 years. Due to the nearly insurmountable terrain, it became well hidden and many thought it to be only a city of myth. Indeed there is not one sign of the Spanish culture nor the Catholic religion to be found there to this day. Then along came Hiram Bingham, an explorer in charge of a Yale University expedition, who wanted to see if the legendary capital of the governing Inca’s descendants was real. Although disputes continue about other explorers having made the discovery as early in 1894, without question it was Bingham who introduced Machu Picchu to the outside world after his re-discovery on June 24, 1911. There are several ways to reach the famous ruins. One is the classic and famous Inca Trail Bingham and other explorers used, which takes even seasoned hikers four days to cover with a guide, or the way we arrived there, by train from Ollantaytambo to our abode in the village of Aguas Calientes and from there a tourist bus over the zig-zag road you see here in a photograph taken by international traveler Brian McMorrow who graciously gave me permission to use it here. He has a very impressive photo-journal of his extensive travel in Peru and you can access all his travel albums by clicking here. 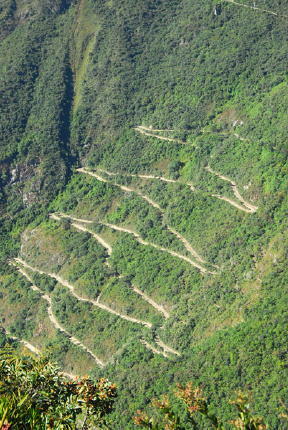 In the past five years, another trail–the Camino Salcantay–has begun to emerge as a popular alternative to the Inca Trail. In fact, a network of high-end lodges have opened for business along the route. You can either set up your own camps along the way or book the lodges, indulging in a hot shower, Jacuzzi, and a home-cooked meal at the end of the day. Maybe if we had done this trip in our 20’s, 30’s–even our 40’s–I would have chosen the alternative trail, but for this stage of my life, the bus was just fine–thank you very much–and at the end of the ride, I was no less impressed with my first glimpse of the ancient citadel. Our guide Ivanoff explained the city’s design. 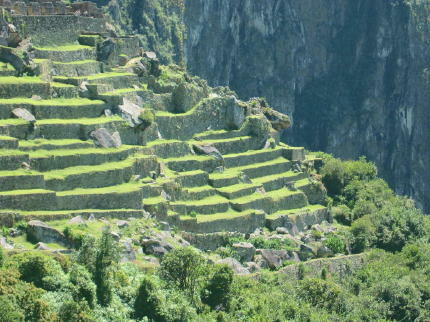 Terraces were built for purposes of farming, the sizes varying according to the slope of the mountain, but some also may have had other purposes, such as securing the mountains from seismic activity of earthquakes. Whether the ancient city was built as a sanctuary for noblemen or as a religious sanctuary of sorts, it functioned much like any other city with areas set aside for residences. Others were reserved for temples to the gods (Condor, Sun, Three-Windows, as well as the principal temples, all named by Bingham) for for the houses of the priests, as well as a uniquely designed water works area built with stone. For stone walls assembled in 1460 and still standing in the 21st century, the walls of these temples are excellent examples of Inca masonry. Some visitors, after seeing this area of the Temple of the Condor (see the head in the foreground) have suggested this as a torture site with cavernous cave like areas (background) built to hold prisoners awaiting execution. From all accounts, however, Incas were an extremely advanced civilization in many ways. They developed a distinctly organized hierarchical class system with the nobility at the top as supreme leaders, religious leaders or chief priests second, then the relatives of those two in third rank. Last were all the other Incas. As the empire grew, Incas were organized by a pecking order of privilege, beginning with those who had lived in Cuzco for a long time and spoke the ancient language (Quechua), under them were the public administrators, then the former leaders of the conquered states, and then came the artisans. The most important point of the whole civilization, however, was that everyone contributed to the whole society, not just themselves or their family. How the terraced areas were landscaped and maintained during the 15th century is up to interpretation and speculation by thousands of real and armchair explorers before us and the thousands more that will follow, but it’s easy to speculate that these modern-day inhabitants who have become popularly referred to as living lawn mowers are one of if not THE most photographed. We ate lunch that day at the famous Sanctuary Lodge located a short distance away. I had seen the lodge and restaurant featured on a television travel show in high definition and had been so looking forward to having lunch there. It turned out to be one of the few disappointments of the trip though. Obviously the strict class system continues in Machu Picchu, which a capsule room rate description will further clarify. The cheapest STANDARD rooms available (no views) at the only lodge available outside Aguas Calientes where our group is staying is at this writing $852 per night. A suite with mountain views commands $1490. Food service likewise. I found there are TWO restaurants in the lodge. There’s the Tampu Restaurant with seating for 72, where you can enjoy Peruvian cuisine with spectacular views of the countryside. Then there’s the Tinkuy that hosts a daily lunch buffet. Guess which one we lunched at? The food, Peruvian as well as international dishes, was definitely good, and there was even a local band trying to play loud enough above the noise of the crowd so as to be heard, but it was really difficult–even with the most positive of open minds–to enjoy it while feeling like a herd of cattle being shunted through the feeding stations. By the way, the relatively small dining area holds a maximum of 200 people. There were at least 188 already seated by the time we arrived. After lunch, we were free to board any one of the many buses headed back to Agua Calientes, or re-enter Machu Picchu. Hubby and I chose to do a little more looking on our own. Nearly all the tourists crawling the terraces were now gone–I suspect to the lodge restaurant–and we saw the lost city in a far prettier, less crowded light. We were both really happy we’d decided to go back, as it was one of the quietest periods of the whole day. And nobody messed with Texas that day either as far as we could tell. Then we walked up to the bus lot to head back down that curvaceous road. You may be surprised to learn the road is two-way! Looking at the road here, I find it extremely difficult to imagine the severe turns or the agility of the hundreds of tourist bus drivers who make the drive each day, but we made it safely. On the way back down, I remember thinking we would be stuck for hours at the very least when our driver was headed into the curve itself and a couple of automobiles coming the opposite direction pushed ahead ignoring the apparent protocol (the driver in or near the curve has right-of-way). None of us could believe it when the driver not only stopped, but began backing up. I think you could have heard the proverbial pin drop. Luckily I was sitting on the side nearest the mountain and wouldn’t see us slipping off the edge of the road and bouncing all the way back to Machu Picchu. I think all our hat’s all went off to the driver after he deftly managed maneuvering that one! The cars, by the way, were those of the police. The class system of the ancient Inca not only continues, apparently it thrives! This entry was posted in International Travel, Peru by Alice. Bookmark the permalink. One of the places on my dream list to visit is Machu Picchu. Thanks for the tour, since I may never make it that far in real life. Thank you for the link Michele. 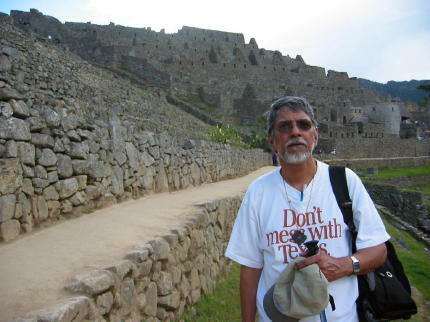 There is still so much intrigue surrounding Machu Picchu–even all these years later. For instance, I understand there’s a pending lawsuit against Yale in which Peru is demanding the return of all the archeological treasures he shipped back to the U.S. for “educational study”. Seems he didn’t quite live up to promises contracted, in using the items for study only. When you delve into things a bit more deeply, you find questionable ethics surround almost every incident involving people, which would make a very interesting post in and of itself. Perhaps things haven’t changed all that much, eh? Or to put it another way, the more things change the more they stay the same! Thanks for stopping by. Simply amazing. Thanks for the photos as I the visual person can now see you there so high in the sky. Thank you!!! About 12,000 feet above sea level to be more precise, Mage! Don’t you love the road? I wouldn’t drive up in a small car, much less a bus! I’m sure glad there are people who are not only willing but able to do this. Thanks for stopping by. 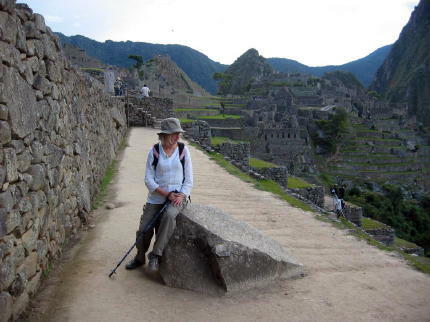 That’s one hack of a place, I cannot think about a more magical, more beautiful place on Earth than Machu Picchu.